HOME - De website van taekoplan! Completely rebuild with a new look and feel. All functionality is on the same place and can be found easily! v4 will be a free upgrade for everyone who purchases v3 in December or January! EXPECTED: End of february (due to a lot of events in this time of the year). We are currently finalizing the product to give you the best user experience. Welcome to the official TaekoPlan support site. This is meant to be a place where all registered users of TaekoPlan can get program updates, get answers to particular questions through our FAQ service and ask other users about specific problems, experiences and other program based items. TaekoPlan is a tool for the planning of taekwondo Kyorugi and Poomsae tournaments under World Taekwondo rules or for sparring, pattern, power test and special technique under ITF rules. All categories and weight/length classes are supported. A complete visual representation of the tournament status for the organizers. TaekoPlan is now officially released in 5 languages: dutch, english, german, russian and spanish. More languages will follow shortly. If there is enough interest in other languages, we will translate the current package. Please let us know at info@taekoplan.nl whether you are interested in a version in your own language or even participate in the translation program. 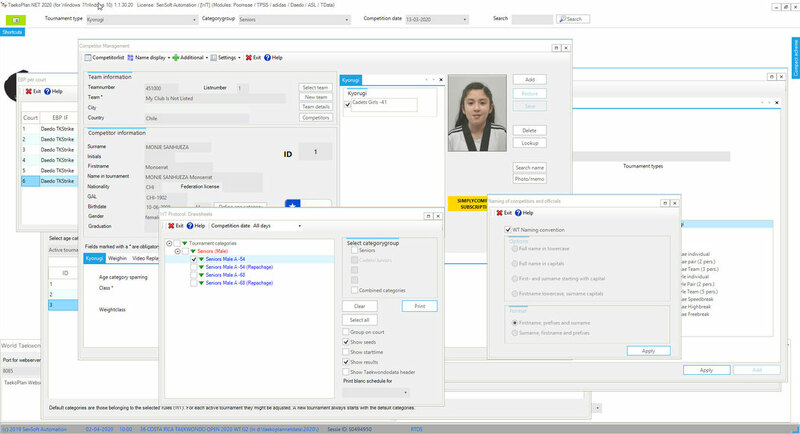 In 2010/11 we have introduced our new connection with Daedo EBP as well as our completely updated TaekoPlan software. Besides Taekwondo, we have moved to other sports also. 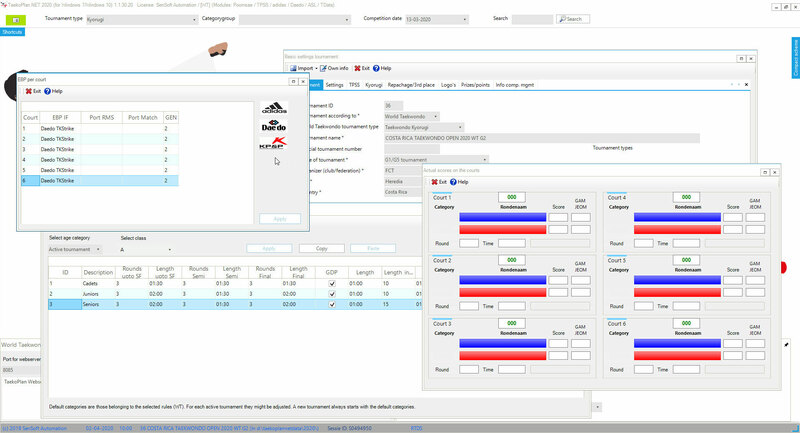 2012 brought the new version 2.00 of TaekoPlan with many features and also ready for the new Global License System, which wasintroduced by WTF for 2013. Providing direct link to WTF Ranking system and Taekwondodata ranking. 2015 brought the long expected interface with the GMS system, which will reduce a lot of issues with subscription for tournaments. TaekoPlan is able to import directly from the Simplycompete website! 2019 brings TaekoPlan v4, completely rewritten with a fresh new interface. TaekoPlan also connects to the Daedo electronic vests! We have the official interface with their scoreboard system. Both Generation 1 and 2 are supported. Also exclusive connections with the BudoScore scoreboard system and ASL! A complete system with tournament management, scoreboard and video replay linked together! Live results on TPSS during the tournament are possible! TaekoPlan is partner for the three major brands in Taekwondo!